How Dye Sublimation Printing Works with Sublimation Materials? 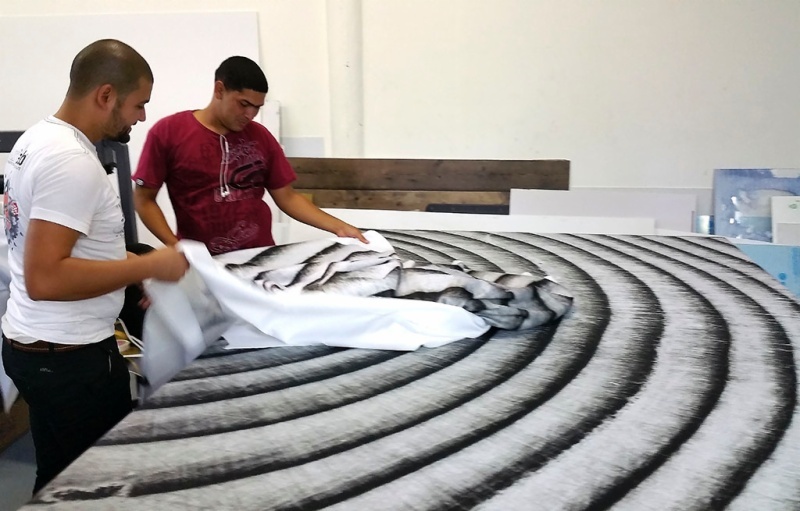 - Fei Yue Paper Inc.
How Dye Sublimation Printing Works with Sublimation Materials? Dye-sublimation printing is the preffered digital printing technology for polyester and other synthetic fabrics and media. The process uses the science of sublimation, in which heat and pressure are applied to a solid, turning it into a gas through an endothermic reaction without passing through the liquid phase. The image is first printed to a special transfer paper. It it then feed through a high pressure roller heat-press which effectively turns the ink in the paper to a gas. The polymer molecules of the polyester or other synthetic fabrics softens under the heat. It “opens up” on a molecular level. The ink which has now turned to gas is transferred INTO the fabric structure which then closes up when combined with the ink. Because the ink is COMBINED into the molecules of the fabric (not printed on top) – Dye Sublimation printed fabrics are supremely washable and rub fast. 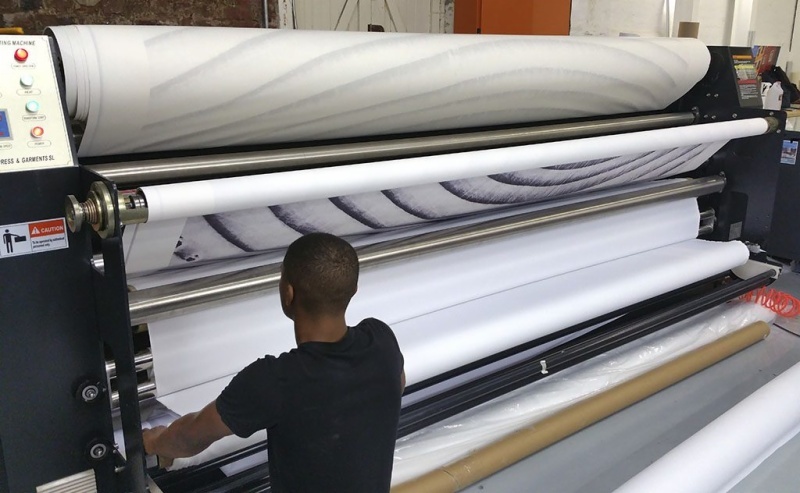 This is our whopping 3.2m wide sublimation calender heat press that transfers the image from transfer paper to any synthetic fabric up to 3.2 meters wide. We put this to use mainly for large textile banners and signage especially for high quality exhibition graphics. Soft signage is becoming ever increasingly popular due to the ease of packing and transport. It is light and can be easily folded for packing getting around the need to ship heavy large rolls of media. Once transferred on the heat-press the printed and transferred fabric goes to our finishing dept. for any finishing that needs to be performed before the textile is delivered and put to work. Sublimation is terrific Lycra/Spandex and other sportswear fabrics. Sublimation onto synthetics is perfect for inflatables like this delightful castle from Airspace. Hot of the press graphics for Potluck Restaurant. It is also great for hard wearing upholstery applications. Next:What Do You Know About Epson SureColor T-series printers?